Check out our new Resource page containing my new book, My Yoke Is Easy. Also available is my Messianic Seder DVD. You can purchase them by clicking the link to the left entitled Available Resources/Purchase Materials. Everlasting Promise Ministries is located in the Kansas City, Kansas area and seeks to reveal through the scriptures God's everlasting promises to Israel and His eternal plan for both Jew and Gentile. Our goal is to enlighten the Gentile church through biblical teaching to God's call on Israel and the Jewish people throughout time. God is not done with the Jewish people--His eternal plan for them is still unfolding and in our day we see evidence of His plan coming to fruition. One focus is on the Covenants that God gave to the Jewish people and how they express His viewpoint, His plan, His purposes, and His love for all of mankind--both Jew and Gentile. Through biblical teaching on subjects such as "Why a Chosen People", "The Covenants", "The History of Anti-semitism in the Church", "God's Irrevocable Call on Israel", and "Repentance", we seek to make the case for Israel and the Jewish people as an undeniable reality to the Gentile church, and a crucial part of God's end-time plan. The relationship between Christianity and the Law of Moses can seem complicated. Followers of Christ have long wrestled with what to do with the Law. Even today, Christians have many questions about how we should approach the Law as believers. If you, or someone you know, is wrestling with those questions, then this book will be a great help. Writing from a Jewish perspective, Frann lays out the biblical approach for understanding the Law as followers of Christ. She helps us to see and appreciate the value of traditions while holding fast to salvation by grace and through faith. My Yoke Is Easy is a great resource for those struggling with their relationship to the Law. 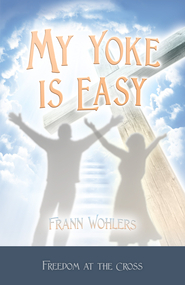 In My Yoke Is Easy, Frann draws from her own journey as a Jewish believer to illuminate our true identity in Christ and freedom from the Law of Moses. This is crucial revelation for all believers in these days. As understanding of our Jewish roots comes t the Church at large, My Yoke Is Easy is a vital resource to clarify what is required of followers of Jesus related to the Law. It is a clear presentation of the scriptural truths found in the Messiah and the more excellent way. Frann's work sets believers free to walk by the Law of the Spirit.